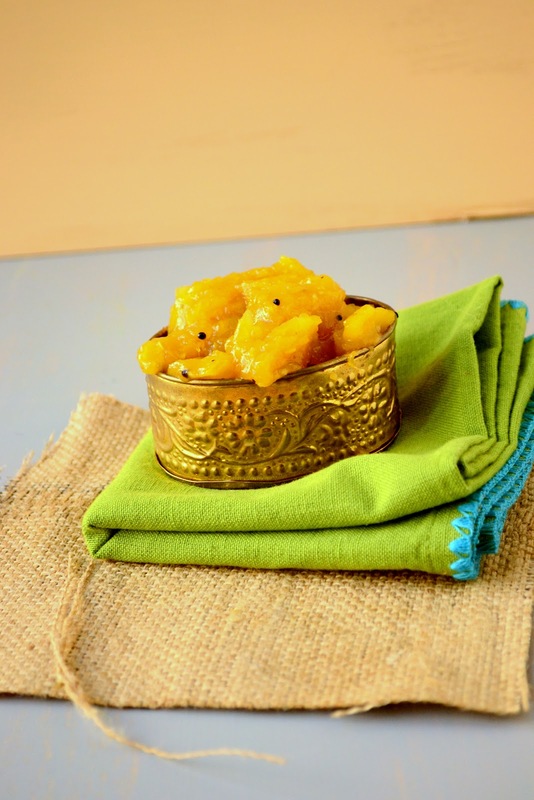 This dish is a simple sweet-tasting avatar of the beautiful tropical fruit – Mango. My little grey matter recollects tasting this delicacy only during festivals. Mangai pachadi was cooked especially on “Varshapirappu” (Tamil New Year’s day) and “Ganesh Chathurthi” (Lord Ganesh’s birthday). Though so simple in preparation, nobody in my household prepared this on days other than a festival. I wonder why? This is one of my most favorite dish which I relish with a bowl of rasam & rice. I don’t why my amma didn’t make it often? The de-skinned raw green mangoes and couple of green chillies were chopped and cooked in the pressure cooker until they soften and then they were paired with hot bubbling jaggery syrup.Finally the thick mixture is tempered with mustard seeds and urad dhal. My mouth is watering just to think about this. Some add dried neem flower to impart a dash of bitterness to the pachadi. Since I couldn’t get a hand on those, I skipped its addition. 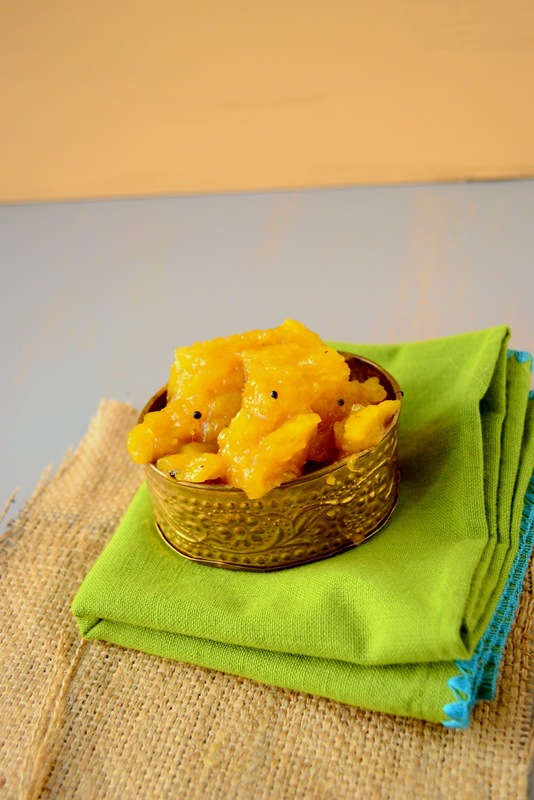 The lovely sweetness from jaggery blends beautifully with the juicy mangoes and the mild heat from the green chillies gives a exotic kick every now and then. The tiny urad dhals gives a delicate crunch in every mouth. Nothing can be so simple yet exquisite in taste . 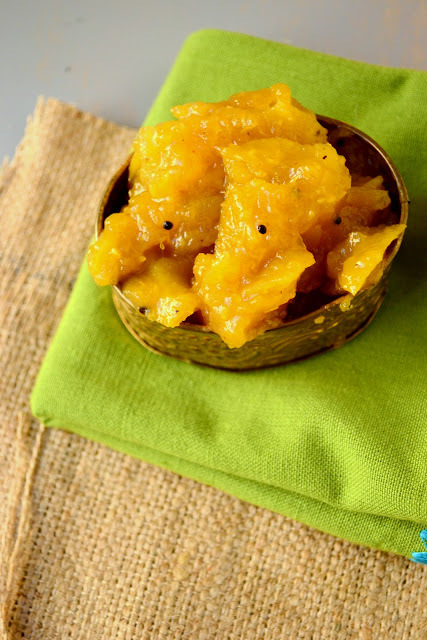 Mango pachadi beams its beauty with its glossy yellow color and speckles of mustard & urad dhal around, which is a true delight to the eyes. I enjoyed it so much that I ate it like a dessert. A true earthly dish to remind you of India. Do try it! I made this for the first time on my birthday which was months ago and repeated it so many times after that. I wanted to share my love for this dish with you all today. They are served a side dish for Indian rice and Sambhar, Rasam or Curd (Yogurt). They can also be used a spread for chapathi stuffed with paneer and Indian chat chutneys (Recipe here). 1. Clean the mangoes and with a peeler remove the skin. Pat dry with a kitchen towel and using the same peeler, gently work around the flesh of the raw green mango or you can chop them into cubes as well. Do whichever is easier for you. 2. Pressure cook the mangoes and green chillie with 1/4 water for 3-4 whistles. Remove excess water. Mash them to a fine paste and cool it. 3. In the mean time, heat about 100 ml water in a cooking pan and throw in the jaggery and salt when the water is boiling hot. Maintain the heat at medium high. Let the jaggery dissolve and as they turn in to a thick syrup, which will happen in 15-20 minutes, add the mashed paste and give it a complete mix. Allow the mixture to thicken for 2-3 minutes and remove from flame. 4. In a small pan, heat the oil. Once heated, let the mustards splutter and add the urad dhal and cook for 2 minutes. Add this to the mango paste and serve hot. OMG! dear u make all recipes my mom makes. This is my mom's favourite one. Looks so good da….. This is nice. I will try preparing it because all these ingredients are available. hey!! if jaggery is used then why salt? I luv this with curd rice, looks yummy! Wow… this is one of my all-time favt viji.. Delicious looking dear! i made this for chitra vishu last year..looks delicious..
manga pachadi looks yummy..very tempting vs…any dish with mango..love it..Nice click!! Like your photo and the curry looks yummy. Such a tempting pachadi, my grandma's signature dish..
Mouthwatering pachadi… just love them. That is an interesting way of preparing mangoes! Surely delicious! So glad to have stumbled on your blog through Foodbuzz. We've made a couple of mango chutnies, so this sounds delicious. We've never used jaggery though. Thanks for bringing it to our attention!